As the established leader in perioperative medicine, this course aims to provide practitioners with the most up-to-date knowledge necessary to deliver Thirty million patients undergo surgical procedures in the U.S. each year, and the age and medical complexity of this patient population is increasing. All these patients require preoperative assessment, intraoperative management, and postoperative care. Every year the body of peer-reviewed literature on this topic increases and new guidelines on clinical management are formulated. Because the breadth of knowledge in perioperative medicine, which includes the diverse disciplines of surgery, anesthesiology, cardiology, pulmonology, hematology, infectious diseases and geriatrics, is vast, many practitioners may not have up-to-date information that is critical to clinical practice. The curriculum for this course was specifically created to address the needs of clinicians who provide care for patients before, during, and after surgery. As the established leader in perioperative medicine, this course aims to provide practitioners with the most up-to-date knowledge necessary to deliver effective, evidence-based care by affecting healthcare practices at the level of the individual and the larger health system. Register with a friend and save $75 each off registration. Please call (410) 502-9636 for instructions to register with a friend. Describe current guidelines for preoperative cardiac and pulmonary risk assessment and list several ways to predict and prevent cardiac and pulmonary complications using preoperative testing and intraoperative and postoperative interventions. Describe bleeding and thrombotic risks in surgical patients and list several strategies to reduce complications through evidence-based use of blood conservation methods, transfusion, coagulation testing, anticoagulant reversal agents, and/or management of anti-thrombotic drug therapies. Describe strategies to control acute postoperative pain using multimodal analgesia and reduce risk for chronic opioid dependency. Recognize how to prevent, diagnose, and treat common healthcare associated infections that complicate surgical procedures. Describe the perioperative complications associated with diabetes, renal insufficiency, delirium, and frailty, and list management strategies to optimize outcomes in patients with these medical conditions. Recognize the impact of structural and cultural factors related to the healthcare system (e.g. provider stress, safety culture, communication strategies) on the safety and quality of healthcare delivery, and describe the potential of various multi-disciplinary programs (e.g. enhanced recovery after surgery) to improve health outcomes. Pediatric Perioperative Management Symposium: Recognize risk factors for adverse outcome in children requiring anesthesia for common procedures. Pediatric Perioperative Management Symposium: Describe strategies to identify and mitigate risk of adverse outcome in pediatric patients who require anesthesia using patient-based, team-based, and/or informatics-based approaches. Pediatric Perioperative Management Symposium: Describe strategies to control postoperative pain in children using multimodal therapy. Point of Care Ultrasound Workshop: Recognize basic views for real-time ultrasound guided vascular access and perform vascular access on simulation equipment using ultrasound. Point of Care Ultrasound Workshop: Recognize and interpret basic transthoracic ultrasound views of cardiac and lung structures. Point of Care Ultrasound Workshop: Apply basic ultrasound algorithms to diagnose and manage an unstable perioperative patient. The Johns Hopkins University School of Medicine designates this live activity general session for a maximum of 24 AMA PRA Category 1 Credits™ and optional Pediatric Perioperative Symposium for a maximum of 3 AMA PRA Category 1 Credits™ and optional Point of Care Ultrasound workshop for a maximum of 6 AMA PRA Category 1 Credits™. Physicians should claim only the credit commensurate with the extent of their participation in the activity. 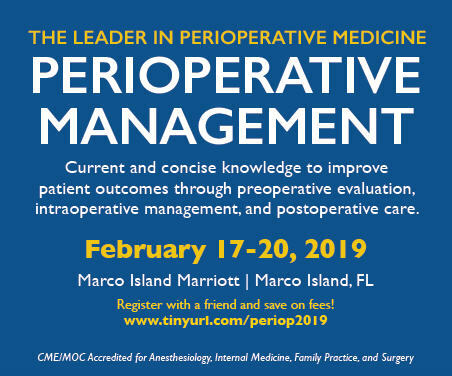 This Live activity, Perioperative Management–In Its 35th Year, with a beginning date of 02/17/2019, has been reviewed and is acceptable for up to 20.75 Prescribed credits by the American Academy of Family Physicians. Physicians should claim only the credit commensurate with the extent of their participation in the activity. A CE credits; Code Number 1036780; Expiration Date 2/20/2019. AANA designates this program as meeting the criteria for up to 2.25 CE Credits in pharmacology/therapeutics. National Certification Program accepts AMA PRA Category 1 Credits™ from organizations accredited by the ACCME. National Commission on Certification of Physician Assistants (NCCPA) PAs may claim a maximum of 24 Category 1 credits for completing this activity. NCCPA accepts AMA PRA Category 1 Credit™ from organizations accredited by ACCME or a recognized state medical society. The Johns Hopkins University has approved this activity for 24 contact hours for non-physicians. This activity should cover topics that are required under the Maryland Board of Physicians pain management requirement. Successful completion of this CME activity, which includes participation in the evaluation component, enables the participant to earn up to 24 MOC points and patient safety MOC credit in the American Board of Internal Medicine’s (ABIM) Maintenance of Certification (MOC) program. Participants will earn MOC points equivalent to the amount of CME credits claimed for the activity. It is the CME activity provider’s responsibility to submit participant completion information to ACCME for the purpose of granting ABIM MOC credit. This activity meets the requirements for CME and selfassessment credit toward Part 2 of the ABS MOC Program. Maintenance of Certification in Anesthesiology Program® and MOCA® are registered certification marks of the American Board of Anesthesiology®. MOCA 2.0® is a trademark of the American Board of Anesthesiology®. This activity contributes to the patient safety CME requirement for Part II: Lifelong Learning and Self-Assessment of the American Board of Anesthesiology’s (ABA) redesigned Maintenance of Certification in Anesthesiology Program® (MOCA®), known as MOCA 2.0®. Please consult the ABA website, www.theABA.org, for a list of all MOCA 2.0 requirements. Special ground transportation rates have been arranged for our attendees. Please click here to make a reservation. If you would like to have wifi in the meeting room, you will need to purchase in advance. Please complete this form and return to the hotel at least 5 days prior to the meeting. 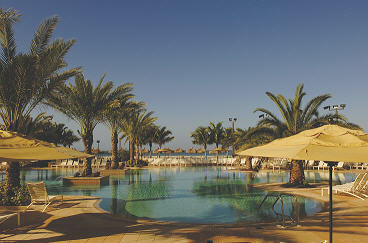 Return form to the Marriott via email, fax or if paying by CHECK, please return via mail. Pediatric Symposium: Pediatric Pain Management: What is New? 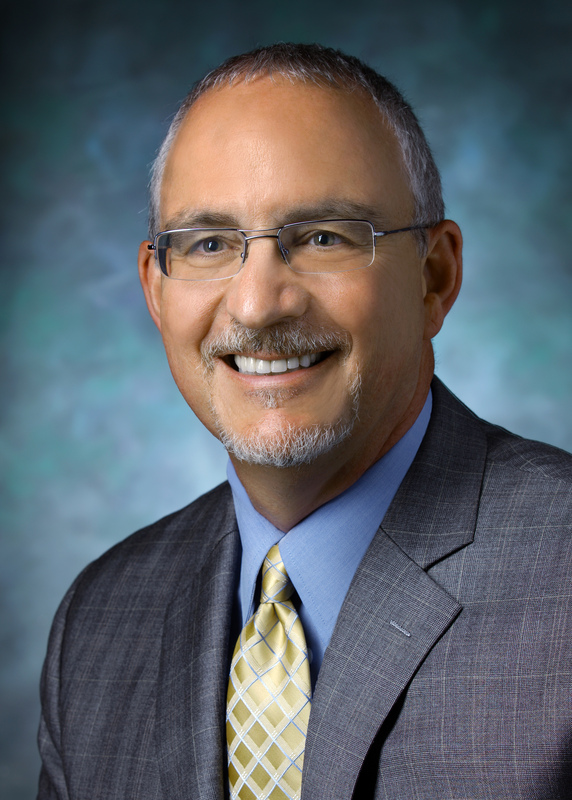 Pediatric Symposium: Is Your Pediatric Patient Ready for Surgery? Pediatric Symposium: Postoperative Patient in Distress: What Do You Do?